[INQ. NO. 1608E06] In 2005, Mamirobot entered the market of robotic vacuum cleaners. The company succeeded in developing the world’s first robotic vacuum cleaner with an automatic mop function in year 2007. The function of automatic mop strongly appealed to consumers, which allowed Mamirobot to quickly gain more than 40% of domestic market share in Korea. Mamirobot developed new and innovative products from vacuum cleaner, while maintaining attractive pricing in the market. Developed in 2011, Pporo was designated as one of the ‘World Class Korean Products’ in 2013, which are selected products ranked among the top five in terms of global market share or products with high potential of advancing into the global market within 5 years. Pporo has a rotary brush for carpet cleaning with an auto mop function. With a more powerful suction system, Pporo K7 was announced as a handheld vacuum cleaner with an automated charging station. The Pporo K7 automatically returns to the docking station for selfrecharging when it completes a task or low on battery. Designed for easier cleaning in narrow areas, such as edges and window frames, Pporo K7 provides the perfect cleaning solution for your home. Mamirobot has exported its products to several countries including Singapore, and Hong Kong. In addition, the company established its branch offices in the U.S., Germany, China, Hong Kong, and Japan in order to provide equal quality of service to all consumers. The company has rejected offers for OEM from several multinational corporations in preserving brand value and quality. With growing demand for robotic vacuum cleaners, the company expects sales volume of next year to exceed US$10 billion. Mamirobot will continue to innovate and develop new products, including vacuum cleaners for commercial use. [INQ. NO. 1512E05] In 2005, Mamirobot entered the market of robotic vacuum cleaners. The company succeeded in developing the world’s first robotic vacuum cleaner with an automatic mop function in year 2007. The function of automatic mop strongly appealed to consumers, which allowed Mamirobot to quickly gain more than 40% of domestic market share in Korea. Mamirobot developed new and innovative products from Vacuum Cleaner, while maintaining attractive pricing in the market. Developed in 2011, Pporo was designated as one of the ‘World Class Korean Products’ in 2013, which are selected products ranked among the top five in terms of global market share or products with high potential of advancing into the global market within 5 years. Pporo has a rotary brush for carpet cleaning with an auto mop function. With a more powerful suction system, Pporo K7 was announced as a handheld vacuum cleaner with an automated charging station. The Pporo K7 automatically returns to the docking station for self-recharging when it completes a task or low on battery. Designed for easier cleaning in narrow areas, such as edges and window frames, Pporo K7 provides the perfect cleaning solution for your home. [INQ. NO. 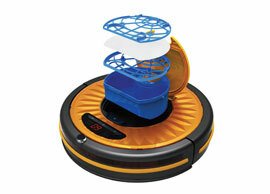 1508E04] In 2005, Mamirobot entered the market of robotic vacuum cleaners. 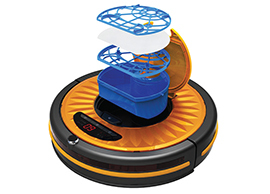 The company succeeded in developing the world’s first robotic vacuum cleaner with an automatic mop function in year 2007. The function of automatic mop strongly appealed to consumers, which allowed Mamirobot to quickly gain more than 40% of domestic market share in Korea. Mamirobot developed new and innovative products from Vacuum Cleaner, while maintaining attractive pricing in the market. Developed in 2011, Pporo was designated as one of the ‘World Class Korean Products’ in 2013, which are selected products ranked among the top five in terms of global market share or products with high potential of advancing into the global market within 5 years. Pporo has a rotary brush for carpet cleaning with an auto mop function. With a more powerful suction system, Pporo K7 was announced as a handheld vacuum cleaner with an automated charging station. The Pporo K7 automatically returns to the docking station for self-recharging when it completes a task or low on battery. Designed for easier cleaning in narrow areas, such as edges and window frames, Pporo K7 provides the perfect cleaning solution for your home. Mamirobot has exported its products to several countries including Singapore, and Hong Kong. In addition, the company established its branch offices in the U.S., Germany, China, Hong Kong, and Japan in order to provide equal quality of service to all consumers. The company has rejected offers for OEM from several multinational corporations in preserving brand value and quality. With growing demand for robotic vacuum cleaners, the company expects sales volume of next year to exceed US$10 billion. Mamirobot will continue to innovate and develop new products, including vacuum cleaners for commercial use.